Monjayaki is another treat from the East, originating from the fast food districts of Tokyo. There's no universal recipe for Monjayaki to speak of, as most restaurants add their own flavors to the dish, but we can still say that this is one of the few healthy fast food choices to go for. Just what is this dish? It's a pan fried vegetable based platter, with some lean meat added to the mix, with a consistency between bread dough and pancake batter before frying. Most of the ingredients are herbs - several different types of cabbages, finely chopped, paprika, zucchini and sometimes carrot. 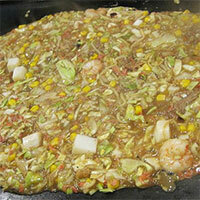 Monjayaki can be made with or without meat, when the meat is added, it's usually some kind of fish. Vegetables provide very valuable minerals and vitamins to the dish, and meat added is rich in protein and on the low side of the calorie value, making this a very suitable meal if you want not to go over the top with calories. The calories in Monjayaki per 542.7g(1 serving) is 510 calories. Monjayaki is calculated to be 94Cal per 100 grams making 80Cal equivalent to 85.11g with 57.63g of mostly carbohydrates、21.44g of fat、18.34g of protein in 542.7g while being rich in vitamins and minerals such as Vitamin K and Molybdenum.